Tap into a real-time, unified view of your company’s finances and operations. Reduce inefficiencies and redundancies so you can optimise company performance, productivity. Integrate front-to-back-office processes such as marketing, sales, and customer service. What is Sage 300 ERP? Human resource management and payroll. Sales, marketing, and customer service. The advantages keep coming. Sage has an extensive network of third-party solution providers whose add-on solutions extend Sage 300 ERP ever further to meet the specialised needs of your business. Imagine a world where your business can process orders, fulfill orders on time, make and accept payments, reconcile your books across multiple companies and currencies, pay employees, and manage projects, all with one trusted solution. Welcome to Sage 300 ERP. With Sage 300 ERP, you will have an accurate, real-time understanding of your financial position, whether it’s cash flow, receivables, or payables across multiple locations, companies, currencies, and international borders. Configurable, simple to use, and accessible anytime, anywhere, Sage 300 ERP helps you stay on top of your business and address financial issues before they become real problems. Sage 300 ERP helps you manage complex finances and remain compliant with government regulations such as Generally Accepted Accounting Practices (GAAP). 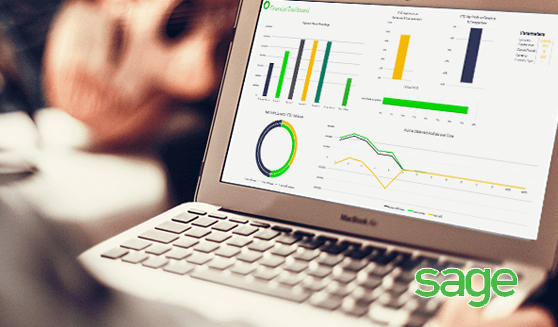 Powerful yet simple : Keep your general ledger up to date in real time and meet your most demanding budgeting and processing needs to with Sage 300 ERP. Manage payables with ease Streamline your entire cash flow process and save money. Sage 300 ERP ensures rapid entry of vendor invoices, flexible cash disbursement, and check reconciliation. You can prioritise payments, negotiate terms, and reduce bad debts. Organise vendor records quickly and easily. Import transactions from other applications. Set up and schedule recurring payables for invoices paid on a regular basis. Calculate tax for vendor invoices or manually distribute tax. Print cheques in multiple languages, including English, French, and Spanish. Easily manage multiple companies: When you’re keeping track of dealings between multiple entities or subsidiaries, Sage 300 ERP reduces the work required for intercompany accounting. Whether you operate as one company, 10 divisions, or 100 entities, you’ll reduce redundant data entry and focus on more revenue-generating activities. Intercompany transactions in Sage 300 ERP allows you to enter General Ledger and Accounts Payable transactions affecting more than one company and automatically distribute transactions across two or more companies. You can set up ultiple companies, close books, and report results by ompany or consolidated company. Simplify international commerce and user support: Managing the complexities of a business across geographies s not easy, but Sage 300 ERP makes it far less complicated. With Sage 300 ERP, you can easily manage international ommerce across multiple companies or subsidiaries. You’ll ave tools to easily maintain an unlimited number of currencies and exchange rate schedules, update exchange rates daily, and post gains or losses from currency fluctuations. Multilanguage support for English, French, simplified and raditional Chinese, and Spanish is included with age 300 ERP and translatable for additional languages throughout the system. erns; automate tax calculations, discounts, commissions and due date, and much more. With the help of uilt-in calculations, you have full control of your receivables nd invoicing and save countless hours avoiding errors and liminating duplicate data entry. Bank reconciliation in minutes: With Sage 300 ERP Accounting Software, you can quickly and accurately reconcile your bank accounts and perform banking transactions with inpoint accuracy.